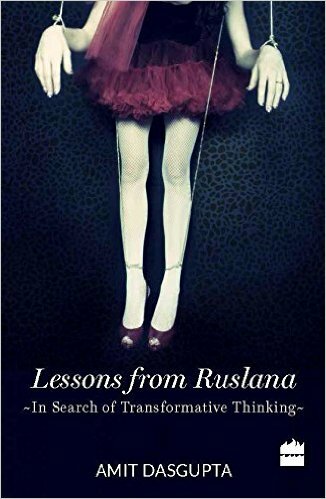 What inspired you to write LESSONS FROM RUSLANA? My inspiration came from a variety of sources, as I was exploring why we do what we do. What is the motivation behind human behaviour? What drives us? As you would see from the book, I delve into the writings and observations of many. I essentially argue that our actions are externally determined. What will others think? Will I be accepted? This is the common driving force: the desire to be accepted, to be welcomed, to be made ‘a part of’. We end up compromising on how we actually think and feel because we crave social acceptance. Consequently, we confuse ‘what is’ with ‘what appears to be’. This was Ruslana’s extreme tragedy. Once she realized she was chasing a myth, a shadow, she felt helpless and lost because there was no escape from the world of illusion. For me she stood as the perfect example when we choose to live the dreams and aspirations that are externally imposed upon us rather than the ones we choose for ourselves. Did you consider writing a novel instead around the same theme? Why did you choose this form? I wanted to write non-fiction in this particular case, as i was re-visiting a theme that has been of such profound interest to so many. The survey of literature in the book provides a glimpse of the world i had entered. It might have worked as fiction but Ruslana’s was not the only tragic story I recount. It is profoundly tragic because when the outside world believes she has ‘everything ‘, she herself believes, she has lost what she desires most – herself. Through the book I explore how this loss, this ‘un-becoming’ confronts us all. How we come out of it depends entirely upon us. What does Ruslana Korshunova and her life and tragic end represent for you? Ruslana represents the pursuit of the transient and the ephemeral. She represents the enormous power the external environment has in terms of defining and thus, determining how we think, relate to people, circumstances & situation, and thus, how we behave. We are even willing to abandon our own thinking and principles so that we might be accepted. We are willing to shut our ears and our eyes and to say ‘we did not know ‘. Lies become our safety net because social acceptance and survival is all we seek. What do you mean when you mean by ‘rewiring our mind-boxes’? Why is this necessary? ‘Re-wiring our mind-boxes’ allows us to recognize that there is a profound difference between ‘what is ‘and ‘what appears to be’. From the time of our childhood, the socialization process determines how we should think and behave. Deviance attracts punishment and hence, we are taught to conform. Our mind-boxes control us. When we decide to stand up for what we believe to be right, we are not deterred by punishment or social criticism. We have then learnt to ‘re-wire’ our mind-boxes. Many have done it and so, it is possible to do so. Success is doing what you love and loving what you do. Time and space then lose significance. You feels deep sense of immersion. I call it passion. At the same time, what you are doing is what drives you. I call this dispassion. But the, for true success, our actions need to be geared towards a cause or motivation bigger than oneself, I call this compassion. Success is the blending of each of these core elements. What are the root causes of suicide? What drove Ruslana to take her own life? Psychologists would say that there are many causes behind suicide. In several cases. In the case with Ruslana, it was a loss of self-esteem. In her own eyes, she felt diminished and inadequate. In some other cases for instance, as explored through alienation literature, there is a disconnect so deep and significant that the individual is unable to cope with who he or she is. Freedom is, then, perceived, by the individual, as lying only in the ultimate liberation – death. How do you think your life and reading experiences have shaped the way you think and write? I believe that from early childhood, I have had the good fortune of being exposed to exceptional writing, films and people. They have had a profound impact on me and in the shaping of my thinking. For each of us, this would have happened. For me the medium of expression is writing. It is how I am able to share my thoughts. Has your career as a professional diplomat influenced the choices that you have made with your writing? Being a professional diplomat gave me the opportunity to travel extensively, to interact with new cultures and to learn how despite our obvious differences, we are all essentially the same. The causes behind human thinking and behaviour are thus, profoundly similar. It is because of this that we can relate to the tragedy of Ruslana’s suicide. Tell us about some interesting people and places that you have encountered during the course of your travels. Did you write about them? In the early days, I used to write about the many interesting people I encountered. An old Egyptian lady, of Jewish descent, for instance, who loved me and my wife like we were her children. But then, I tucked these stories away and hope to write them down soon. Where is your writing going from here? I am just finishing a set of long short stories set in Calcutta, which has been a wonderful writing experience. I have also started on the outline of a non-fiction manuscript on how we hate to fail and what we might be able to do about it. The latter manuscript explores in more detail one of the themes from ‘Lessons from Ruslana’ – that of failure and especially, the fear of failure.